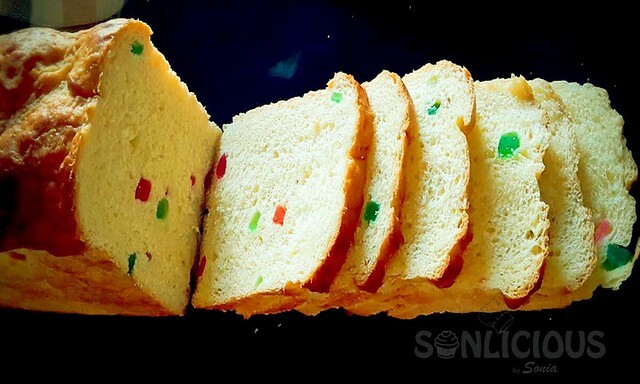 Tutti Frutti bread is commonly used Pav for Bun Maska in Mumbai. This bread goes great with afternoon tea and morning breakfast. I had a special request from one of my blog visitor, Samreen, for the recipe of sweet Tutti Frutti bread. I am now obliged to provide the recipe and feel happy to do. If you need a recipe for whole wheat bread, click here. 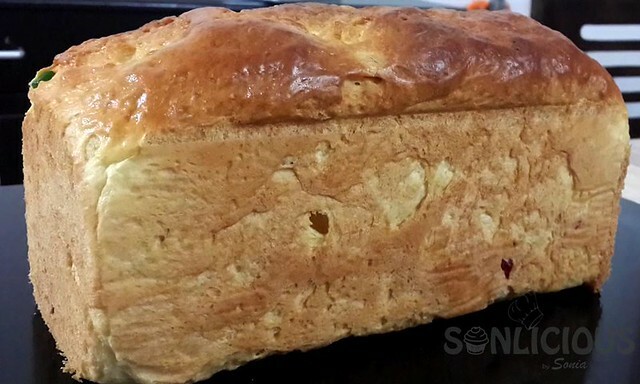 This is eggless fruit bread recipe and hence it is completely vegetarian bread. 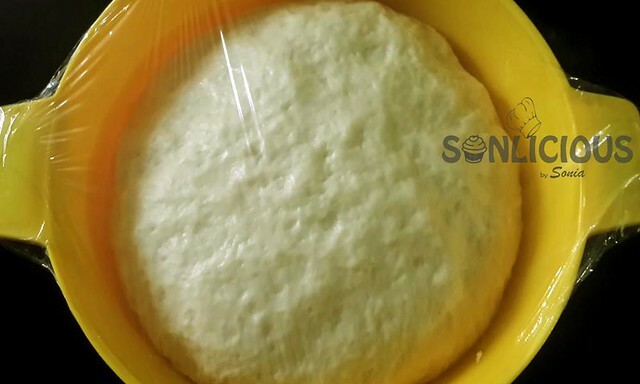 In this recipe, I have not used milk powder, however, feel free to use milk powder if you like to. Milk powder will increase the sweetness of the Tutti Frutti Bread. You can also use sugar to make the bread sweeter, however increasing the sugar content might increase the bread fermentation time. If the bread takes the time to ferment, you must give it time. You should always ensure to wait until the bread doubles in volume, irrespective of the time it takes. Time of fermentation is also dependent on the weather conditions. Colder the weather, higher the time to ferment. Once you have the dough ready, you can use the same dough to give it a shape of a bread loaf or a shape of a sweet Indian bun. You can be creative with your vegetarian sweet tutti frutti bread by using dry fruits, nuts, sunflower seeds, sesame seeds etc. Adding flavor to tutti frutti bread, for example, orange and pineapple fresh juice/essence while kneading the dough, can also make your bread exotic. 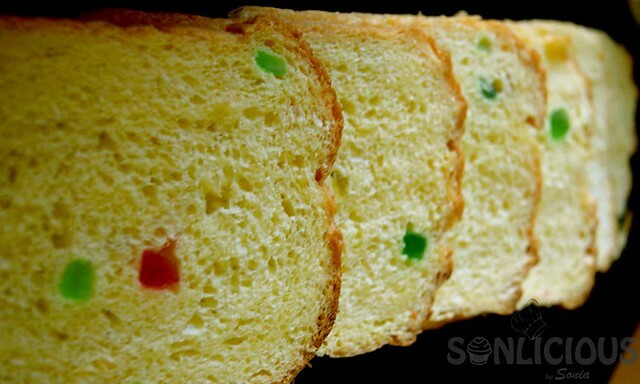 I have used vanilla flavor custard powder to give color and taste to the sweet tutti frutti bread recipe. 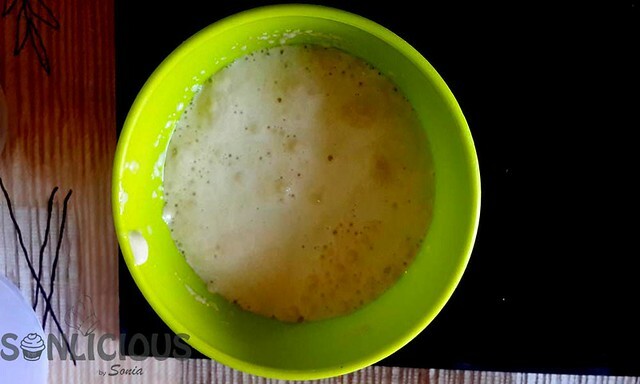 If you are using Active yeast, remember to see the bubbles before you mix the yeast in flour. For people who wish to use Instant yeast, do not add the instant yeast directly in the flour. I have seen bakers advising that we can use instant yeast directly. The answer is yes, we can, but there are few odds in using the instant yeast directly. There are two reasons for not to do so. First, if the instant yeast has expired or nearing to expiry the bread dough will not rise and the effort and material will go waste. Second, wherever and whenever the instant yeast granules come in contact with salt granules, the yeast granule gets killed. I am sure, by know you have enough information and knowledge to start baking your bread. Take 50ml LukeWarm Water. Add 1 tbs of Sugar and Yeast. Mix it well and keep it aside until it froths. In a mixing bowl, take all purpose flour, 2 tbs oil, 4 tbs of sugar, ½ tbs of salt, and 2 tbs of custard powder. Add activated yeast solution in the bowl and knead a dough. While you knead, add water as per the requirement. Every flour had different absorption capacity to water, so handle it carefully. Initially, the dough will be sticky. You will need to knead dough for another 10-15 minutes for it to become non-sticky and elastic. Keep the kneaded dough in a greased bowl and cover it with cling wrap. Keep this aside for about 30-34 minutes or until the dough doubles in volume. This process is called the first rise. After the first rise, take the dough on a surface, lightly dusted with flour. Punch the dough to release the air in the dough (carbon-di-oxide). Spread the dough on the surface and sprinkle tutti frutti. Gently fold the dough and knead it for another 5 minutes. If you feel that the dough is sticky, you may dust the flour and knead it further. 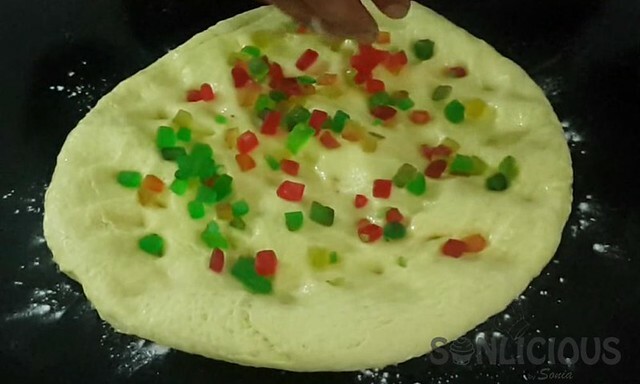 The purpose is to mix the tutti-frutti evenly in the dough. Shape the dough into a loaf and place it in a greased loaf pan. Cover the loaf pan with a cling wrap and keep it aside for another second rise. The process should take about 30-40 minutes. The dough should again double in volume. After the second rise, remove the cling wrap. Give milk wash to the dough. In the meantime, preheat the oven at 200 degrees for about 10 minutes. Once the loaf is baked (about 35 minutes), take the loaf out and de-mould it. To keep the top crust soft, brush the crush with butter and let it rest on a wired rack for 2 hours, before slicing. If you like my recipes, follow me on Facebook, Instagram, and Pinterest. If you like to watch video recipes, check my YouTube Channel for more amazing recipes. 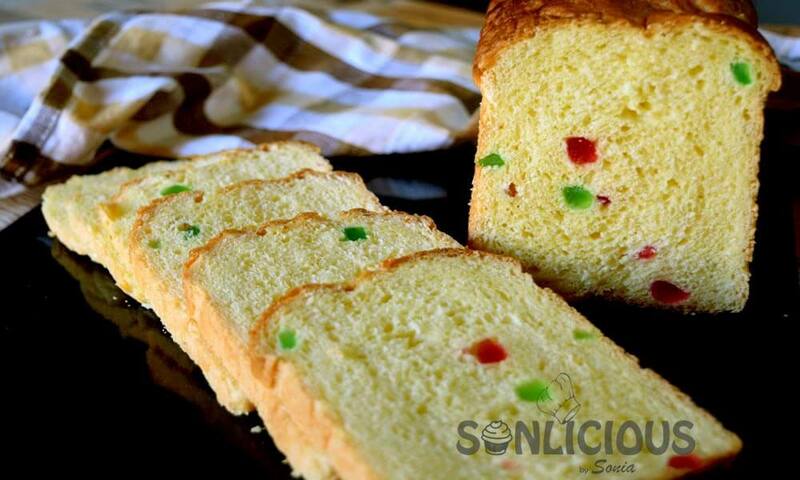 The sweetness of your childhood was incomplete without a tutti frutti bread. Let's recreate the childhood with my step by step recipe. Initially the dough will be sticky. You will need to knead dough for another 10-15 minutes for it to become non-sticky and elastic. Spread the dough on the surface and sprinkle tutti frutti. Gently fold the dough and knead it for another 5 minutes. If you feel that the dough is sticky, you may dust the flour and knead it further. The purpose is to mix the tutti frutti evenly in the dough. Preheat the oven at 200 degree for about 10 minutes. After the second rise, remove the cling wrap. Give milk wash to dough. I am a Food Blogger, Experimental Baker, Author, Recipe Creator and Product Reviewer. My interests range from Photography to entrepreneurship. I am also a home baker and conduct baking workshops. Through my workshops I help home makers become home bakers. In my food blog, I write mostly about healthy baking recipes. Tried making it with whole wheat flour and came out very well and soft. Happy to know your successful attempt. Do share the picture of your bake on my facebook group ” Anybody can bake by Sonia Gupta”. Mam can i ask you one more thing ? Mam i m student of bakery and confectionery professional. Suggest me some top bakery in north india for internship. Thanks for connecting, however, I do not have direct contact with bakeries there. Sorry about this. I have been enlightened enough by teachings and comments. A great lesson to support me make more out baking. Constantine. Thanks for such delightful feedback. 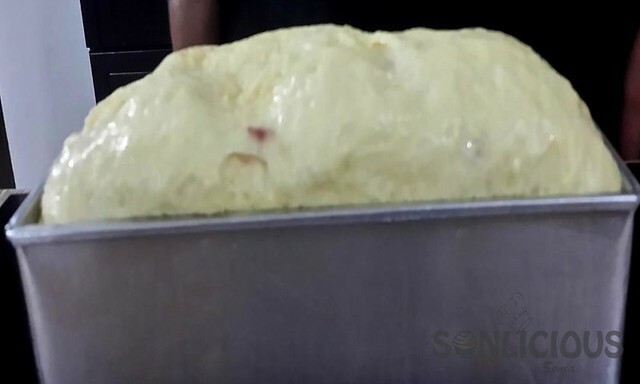 Can I replace custard powder with milk powder. No one likes custard powder at my place. Also plz let me know what is the role of custard powder or for that matter milk powder in breads / cookies. 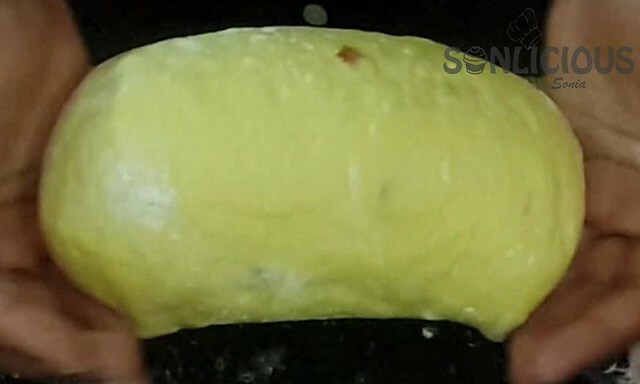 Custard powder/milk powder increases the richness and flavor of the recipe. yes, you can use milk powder instead. Hi Sonia myself Geeta I tried this recipe ..but after baking I found cracks at both sides of the bread.i followed all the instructions u have given . Most of the time it is the shaping that goes wrong and the bread get cracks. Hi Sonia, I have tried lots of your recipes. I have tried this tutifrutii bread with wwf. everything was fine unit the loaf tin went into my oven. I have the convection oven i have kept in 150 degree for 45 mins but the bread was not baked completely and the top started to turn crips 🙁 Can you please help me regarding the oven temperature for convection. Thank you for trying my recipes. Regarding your query on Tutti frutti bread, bake it at 180 °C in your Convection oven for 35 min. After baking, brush the bread top with butter. let the bread rest for minimum 2 hours and then slice it. Thanks a ton yaar! Actually tried this recipe and had a best time.. but forgot to thank u in a busy schedule… Sorry for the late reply, anyways! Thanks again.. Thanks Samreen. This is great to hear that you like the results of the recipe. Which yeast is best instant active/dry/fresh? Prefer using instant active yeast because of its long shelf life. Dry yeast is always the last preference. I generally do not recommend using dry yeast. Instead of water can we use milk for kneading. Yes, you can certainly replace water with milk. My suggestion instead of using 100% milk, keep 50-50 of water and milk, because the recipe is already calling for custard powder. Raksha, fermentation is essential for baking bread and that can happen only with yeast. 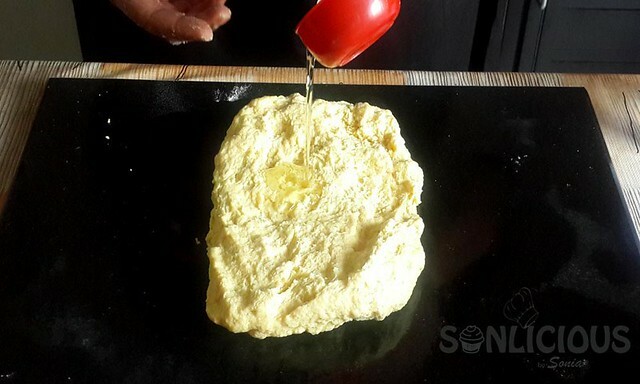 However, few people mix baking powder and lemon juice while kneading the flour and bake their bread. Such breads are more like a cake and will be denser then the regular bread. – Remove, cool, turn over, slice. – Variations by adding various nuts, raisins or grated beets, carrots or whatever firm but sweet grated vegetables. Can I make this with whole wheat flour . You can try, however changing the flour will change the result totally. Thanks for your encouragement. I am committed to providing detailed recipes on a regular interval. Your kind words keep me going. Thanks for making my day. Pleasure is all mine, Samreen. I love working with brands that I have used personally and happy with the results. We can partner together and create quality content for my readers. We can work together on Recipe Development, Food Writing, Sponsored Posts, Product Reviews, Contests, and Giveaways.